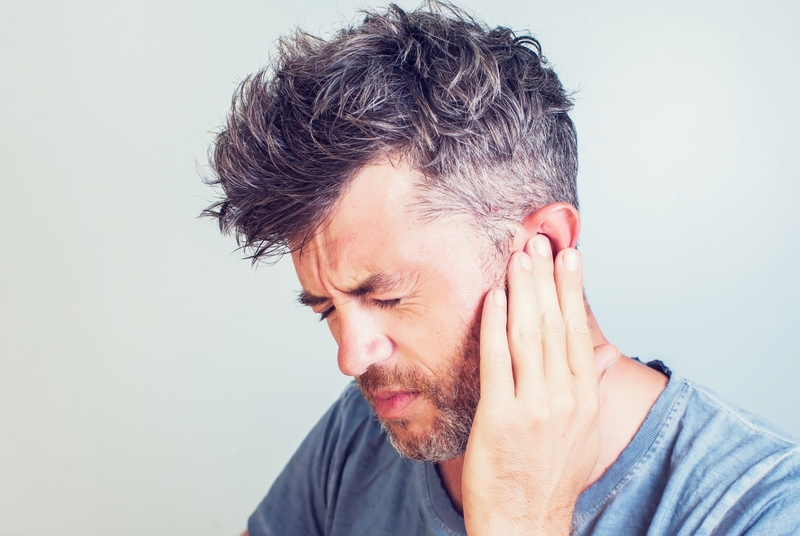 Ringing in the ear and tinnitus can be caused by a variety of issues, including head injuries, ear wax buildup, experiencing loud noises, among other causes. If you suffer from tinnitus (which results in a noise or buzzing in the ear), or from the ears ringing, which may be associated with a degree hearing loss, then you may not be able to treat the issue directly. However, you may be able to mitigate ringing or noises caused by tinnitus. Avoid alcohol and caffeine, among other stimulants and drugs, which may worsen the problem. In addition, you can listen to soft music or other noises to distract from the ringing or buzzing sound. Avoid situations that may be noisy, or use earplugs to deaden the noise. Loud noises can create further problems. Eat a healthy diet to improve the odds of recovery from any damage that has occurred. An ear infection may be marked by pain, excess ear wax, ear drainage, congestion, headaches, runny nose, dizziness, or even bleeding from the ear. If you experience sever symptoms, you should seek medical attention. You may be prescribed a medicine to treat the infection. In addition, you can seek out over the counter drugs that are designed to treat the aforementioned symptoms. You can also use a warm compress to alleviate some pain and to try to improve the recovery period from an infection. In addition, you can use over the counter pain relievers to reduce the pain you experience — however, you should not give painkillers to children without a doctor’s approval, since it may lead to complications. Pressure can build up in the ear due to excess ear wax, allergies, blockage from a foreign object, changes in altitude, and swimming, among other causes. If you’re experiencing ear pressure, you may be able to alleviate the pressure yourself. You can try chewing gum, yawning, sucking on hard candy, or gently exhaling pressure into your oral cavity while plugging your nose and closing your mouth — do not overexert yourself when trying this technique, or you may cause further damage. If pressure persists, seek treatment from a physician. Also, seek treatment if you are experiencing hearing loss, fever, severe pain, difficulty balancing, ear bleeding, or fluid drainage. If you’re still suffering from an earache or your symptoms are growing worse, then you should seek medical attention. You can stop into our office here in Ashburn for a diagnosis and treatment plan. Feel free to schedule an appointment, or stop by for a drop-in appointment during our hours of operation.